Do you have a mattress that has annoyed you for years? Maybe you find it uncomfortable to sleep on because it has become too firm for your taste. Or you maybe bothered by the impressions that your body leaves on the mattress whenever you move to another part of the bed. Whatever the reason maybe, the point is that you are bothered by your mattress and you could be looking to replace it. Yet you do know that a mattress doesn’t come cheap. You will have to shell out another $1,000 or so. And you may not be sold at the idea of throwing away your mattress, even if it is already old. So what options do you have? Try getting a memory foam mattress topper, which can rejuvenate your old mattress. With a new memory foam mattress pad, your bed will be a lot more comfortable to sleep on. What’s more, you don’t have to pay a lot for it. The LUCID 3 inch ventilated memory foam mattress topper, with a three-year warranty, could be the right addition to your mattress. It is soft and luxurious. According to those who have used it, the mattress topper feels nice and comfortable to sleep on. And it won’t make you sweaty throughout the night, particularly during the warm months. Aside from queen size, this mattress pad made of memory foam is available in six other sizes—king, California king, full XL, full, twin, and twin XL. Memory foam has been around for quite some time, having been developed in the 1970s by the NASA. Later on, it was used in medical applications. It was found to have an effect on patients, as they reported to have less back pain and felt more refreshed after sleeping on mattress made from the said foam. But it was until the early 90s that the public first saw a glimpse of what the material can do. It was used first for mattress toppers, and then mattress itself. This memory foam boasts of an open cell formula, which according to the manufacturer, compresses uniformly and improves breathability. The latter is important if you are the type of person who sleeps hot. Unlike the old foams that compress and then spring back to their original shape when you leave them, a memory foam mattress works differently. It compresses fully upon contact, and then spreads the pressure to adjoining cells. This leads to decreased pressure that you feel when you lay on the mattress topper, reducing pressure points in the process. This characteristic of said memory foam mattress topper makes it a good choice for people who are slowed down by chronic pain and aches, particularly in the back, hips, and shoulders. 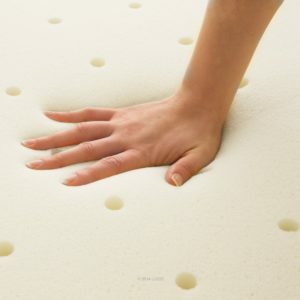 Compared to the old mattresses, memory foam mattress toppers adapts to the shape of your body. This is important, as the mattress can maintain the spine in a neutral position. And when you leave the bed, the mattress topper slowly goes back into shape. For your increased peace of mind, the memory foam mattress pad topper comes with a three year limited warranty. The manufacturer will replace or repair the mattress pad should there be manufacturing defects that appear during the warranty period. To make a claim, you may be asked to send photos of the mattress pad topper. You will also have to send a copy of the receipt and the order ID number. 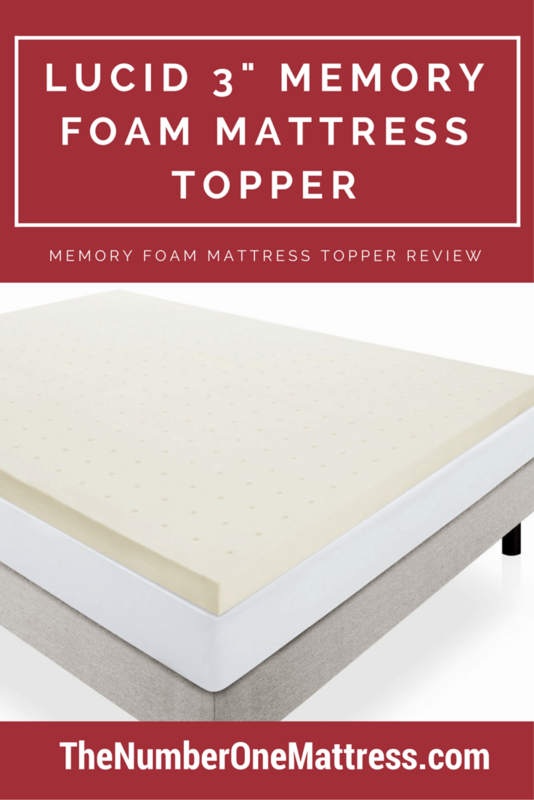 Overall, the LUCID 3″ Memory Foam Matgtress Topper is well-recommended by Amazon.com users. It enjoys high ratings on the popular online website, and many people are actually encouraged to buy it because of the favorable reviews and ratings. One of those people who was intrigued by those positive reviews is a 40 year old man who says he was unhappy with the mattress he bought. He was resigned to the fact that the mattress he chose was too firm for his taste. There were no physical or manufacturing defects, so he could not return the mattress. So he bought the mattress topper with the hope that it will at least make his bed more comfortable to sleep on. He was impressed with the weight, as he thought that 3 inch memory foam mattress pad topper was big. Because was lightweight at 2.2 pounds, he was able to easily place it on his mattress. He remembers that on his first day of using the mattress topper, he was able to sleep soundly. He says he even woke up an hour late in the morning because he was so tired, and he credits the mattress topper for being able to sleep that well. Another reviewer, a 60-year old grandmother, says she wanted to replace her old mattress but her son recommended buying a mattress topper instead. The old lady says she has chronic back pain made worse by sleeping on an extra firm mattress. The price of a new mattress was a bit steep for her, so she listened to her son and ordered for this mattress topper instead. She was also surprised that the mattress topper was lightweight that she was able to carry it on her own, and bring it to her room. Putting it on top of the mattress was not difficult at all, and she loved that it was three inches thick. It added some height to her mattress, she added. When she slept on it, the reviewer was pleased that the mattress was luxurious and soft for her back. It has also helped relieve some pressure points, particularly on her back. There’s still some pain every now and then, she admits, but it wasn’t as painful as before. Yet not every owner of this mattress pad topper is happy with their purchase. As mentioned earlier, perhaps the most common concern of owners is the smell that it emits. And while Lucid claims that the smell won’t cause any allergies, there are still a number of owners who became sick because of the odor. One reviewer says that she developed cough and colds the first week of using it. While she acknowledged that it made her bed more comfortable to sleep on, she could no longer bear the smell that she had to return it. While it has its weaknesses particularly its chemical odor, this 3-inch ventilated memory foam mattress topper should give your bed a new lease in life. It can make your otherwise firm mattress the extra cushion that you need so that you can sleep better at night. And with its design, this mattress pad topper won’t make you sleep hot. You can look forward to having longer, more refreshing rest with this mattress pad. 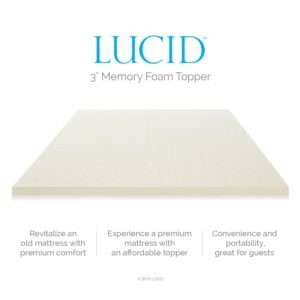 If we are to believe the reviews of many Amazon.com users, this 3-inch ventilated memory foam mattress topper from Lucid is one of the best choices among mattress pad toppers.